Go somewhere new the next time you visit this tourist favorite. Not your first time in Hong Kong? Chances are you’ve probably explored the usual haunts like The Peak, Avenue of Stars, and Temple Street Night Market. This year, fill your itinerary with new places to visit and yummy food to try! Check out our list below. Eat character-themed dim sum at Dim Sum Icon. Take your dim sum experience to new levels of cuteness when you eat at Dim Sum Icon. Can you say Instagrammable? They change their theme every few months, so you’ll have to check who they’re featuring when you get there. From everyone’s favorite egg, Gudetama, to the lovable Crayon Sin Chan, they’ve tried it all! Tip: The food can be pricey, so check if they have an afternoon discount promo running. Visit the Lam Tsuen Wishing Trees. If you’re in Hong Kong for the Chinese (Lunar) New Year, pass by Tai Po to see the famous Lam Tsuen Wishing Trees and participate in the Hong Kong Well-Wishing Festival. Originally, there were two banyan trees, and during special occasions, locals would tie joss paper with their handwritten wishes on them onto oranges and throw them at the branches. Now, locals and tourists alike can put their wishes on a wooden rack or a plastic tree instead of on the actual trees. Go up the Central—Mid-Levels Escalator. If you watch Korean variety show Running Man, you might have seen them featuring this. Known as the “longest outdoor covered escalator system in the world,” the Central—Mid-Levels Escalator is a normal commuting route for locals going from Queen’s Road Central to Conduit Road. You can make your exit to different streets along the way and explore different restos, shops, and art centers, among them the heritage building PMQ, which is now a hip design center for artists. Experience the best wonton at Mak’s Noodle. Hong Kong’s got plenty of affordable yet tasty noodle places, so you’ll never run out of restos to try. The truth is, you can get the best dishes at hole-in-the-wall eateries and small diners. Mak’s Noodle along Wellington Street is one of the most popular, thanks to their super stuffed and incredibly yummy shrimp wontons served in a small bowl of noodles and broth. Buy cheap and chic clothing at Argyle Centre. Skip the Ladies’ Market and head straight to Argyle Centre for the ultimate shopping experience. This multi-level shopping center is where you should go if you want to buy the latest in HK fashion at bargain prices. Located along Nathan Road, Argyle Centre is like Hong Kong’s version of BKK’s Platinum Fashion Mall. Brave the throngs because the prices (and the fashion) are totally worth it! Have a drink at a rooftop bar. What’s a trip abroad without an epic night out? Take your friends to a rooftop bar like Sevva in Central to get an amazing view of HK’s skyline while you have your cocktails! If you’re feeling more adventurous, experience a taste of Hong Kong’s nightlife and sign up for a pub crawl to meet new people while getting some good drinks. Feel like royalty at the Museum of Tea Ware. Walk around Hong Kong Park and you’ll find the Flagstaff House Museum of Tea Ware (entrance is free!). This elegant Western-style building used to be home to the Commander of the British Forces in Hong Kong. Now, it’s a quaint place for tea lovers to learn about tea and admire beautiful ceramic tea ware. You can also up your game and experience conducting a tea ceremony for an additional fee. Watch a Sky Show at the Hong Kong Space Museum. If you want to try something new, book some tickets to either an OMNIMAX (IMAX in a dome) Show or a Sky Show at the Stanley Ho Space Theatre. The special theatre will immerse you in the film’s environment and make you feel as if you’re part of it. They’ve got different shows available from documentaries to fun films, so make sure to check online to see what’s running. Hop on a ding ding. 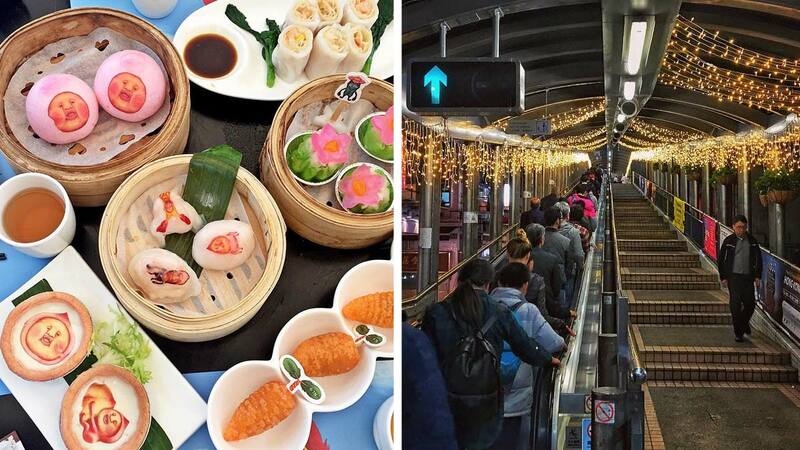 Hong Kong’s famous double-deck trams or ding ding are a fun, affordable, and convenient way to travel around the city. If you don’t want to use them as simple transport, you can also try booking an open-top tram sightseeing tour, so you can learn about the city from a tour guide as you go along. Just behind Mongkok MTR station along Argyle Street, you’ll find this hidden alley with walls filled with unique graffiti. It’s perfect for taking selfies and OOTDs before heading to your next destination. Get some sun at Repulse Bay. If you miss our home country’s tropical vibes, take a bus from the city center to get to this gorgeous beach destination where you can swim or simply bask under the sun’s rays. Once you’re done admiring the view, you can shop and dine at The Pulse or even visit a spa for a relaxing massage. Have a meal at the Po Lin Monastery. The Tian Tian Buddha (or the Big Buddha) is a popular tourist attraction in Lantau. Once you’re done climbing up the 268 steps and viewing it up close, you can go back down and head to Po Lin Monastery for a special vegetarian meal at their restaurant. This peaceful place is also home to the stunning Grand Hall of the Ten Thousand Buddhas. Take a boat ride around Tai O Fishing Village. Located just a few bus stops away from the Tian Tian Buddha, this quiet fishing village on Lantau Island is famous for its stilt houses and village market. Be sure to try their local delicacy, dried fish, and get some fish balls for a snack. You can also go on a boat tour that takes you around the stilt houses before going out into the ocean, where if you’re lucky, you can view some pink dolphins. Get the best shopping bargains at Citygate Outlets. Love branded items but find them too pricey? Visit Citygate Outlets where they have year-round bargains on international brands for clothing, shoes, bags, and more. Now’s your chance to snag some Adidas or New Balance sneaks without breaking the bank. Some stores even have bigger discounts when you buy more items. Check out what brands they carry here. Head to Yim Tin Tsai in Sai Kung for an ecotourism tour of this once abandoned island. Once home to a Hakka group in the 19th century, the island’s population eventually went down to zero as the locals left to find greener pastures, the South China Morning Post reports. Now they’re reviving the art of salt-making on the island, and they’ve even won a UNESCO Cultural Heritage Conservation Award for their efforts. Hike up the Dragon’s Back Trail. Get some exercise time in while enjoying the view when you take this scenic hiking trail! While doing the entire trail is said to take around four hours, you can always choose where to stop. You can already get a lovely view of Shek O Peak and the Dragon’s Back from the Shek O Peninsula Vantage Point, just 20 minutes into your hike. Tip: Bring lots of food and water because there’s nowhere to buy along the trail. Have a white Christmas at Hong Kong Disneyland. Experience the Hong Kong New Year Countdown. Aside from Chinese New Year, Hong Kong also celebrates the Western New Year with plenty of fanfare. If you enjoy grand events and don’t mind crowds, you know where you should be on December 31, 2018. Everyone will be out and about, looking for the perfect spot to watch the amazing fireworks (with music!) display on Victoria Harbour that will ring in the New Year.